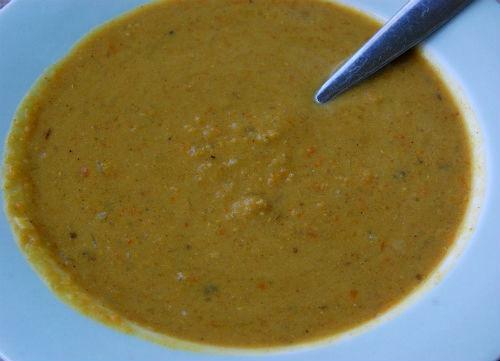 A rich soup made with dal, vegetables and flavoured with curry powder. 1. Add the toor dal, potato and cauliflower to a pressure pan. 2. Pour 4 to 6 cups of water and pressure cook until soft. Adjust the water quantity as desired. 3. Remove and blend until smooth in a mixer. 4. Heat butter in a large pan over medium flame. 5. Add the carrot, onion, apple, radish and celery. 6. Stir well and cook for 5 minutes. 7. Add the dal mixture and gently bring to a boil. 8. Simmer for another 5 to 8 minutes. 9. Add curry powder, salt, pepper powder and coconut milk. 11. Pour into individual serving bowls and garnish with coriander leaves. Feel free to comment or share your thoughts on this Mulligatawny Soup Recipe from Awesome Cuisine.